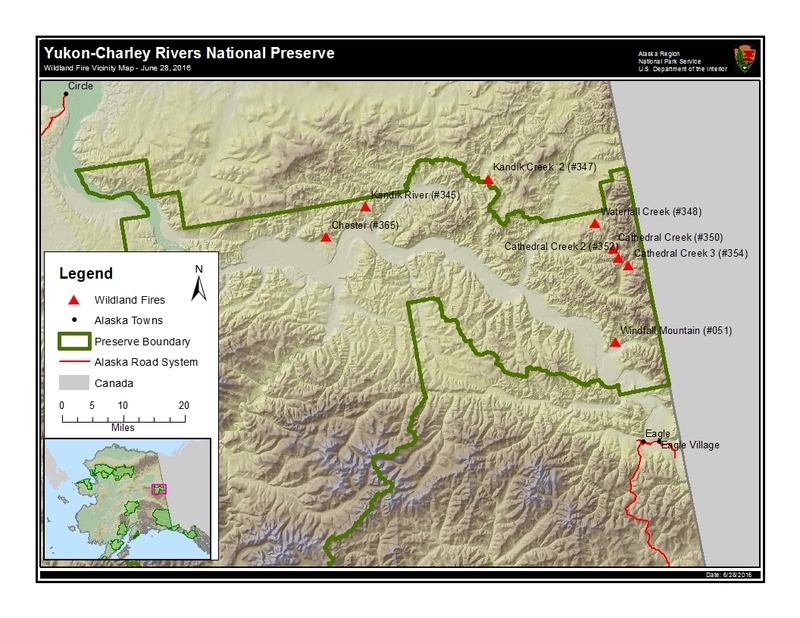 EAGLE, Alaska: Last weekend’s lightning storm ignited seven fires within the boundaries of Yukon-Charley Rivers National Preserve. The largest is the Kandik River Fire, estimated to be 559 acres as of late Tuesday. It is located approximately 5 miles north of the Kandik River public use cabin and 75 miles downriver of Eagle. The Chester Fire is approximately 10 acres. It is also on the north side of the river, about 25 miles downsteam of the Kandik River fire and north of Slaven’s Roadhouse. Both fires are being monitored and neither are currently threatening these structures or other cabins in the area. The five other fires are on Doyon Corporation land on the eastern side of the preserve, north of the Yukon River. Those fires range in size from 9 – 300 acres. This information will be updated when there is a significant change in fire activity. Fire in Alaska’s boreal forest is an essential process that restores ecosystem health and helps maintain species diversity. Both black and white spruce depend on intense ground fire to clear organic layers thereby exposing fertile seedbeds. Black spruce particularly depends upon fire, as its seeds are ready for germination at the peak of the interior Alaska fire season, and are released when canopy fire opens its semi-serotinous cones. Fire also plays a key role in the regulation of the permafrost table. Without the routine occurrence of fire, organic matter accumulates, the permafrost table rises, and ecosystem productivity declines. Vegetation communities, wildlife habitat and wildlife become less diverse. Fire as an agent of change maintains and rejuvenates these systems. Additional information on the preserve is available at http://www.nps.gov/yuch or by calling the Eagle Visitor Center between 8:00 am – 5:00 pm at (907) 547-2233.